The NJ Appellate Court just gave the Murphy Administration an easy way to ensure that all current high school students can graduate & keep the Governor’s campaign promise to move away from PARCC! If only this were truly a victory for students and families. But, instead, it’s a victory for those who fear accurate reflections of student proficiency.. I keep coming back to Repollet’s appearance before the State Board of Education where he told the members that he regarded a 440 on the math SAT as a “passing score.” According to the College Board, a 440 is the 25th percentile for a “nationally representative sample,” 22nd percentile for someone actually taking the SAT, and represents a 9th-grade level. A student who tops out at a ninth grade math level gets a NJ high school diploma but can’t pass the eligibility test for the military, which requires knowledge of algebra and geometry? These low expectations are an affront to our teachers and students. (Special needs students have always had and will continue to have other options.) But, from all appearances, NJEA, Education Law Center, and SOS-NJ prefer perpetuating a charade that parents and students can’t parse. Knowledge, I’ve hear, is power. But to these anti-accountability groups, lack of knowledge is power — for them, if not for the constituents they pretend to represent. 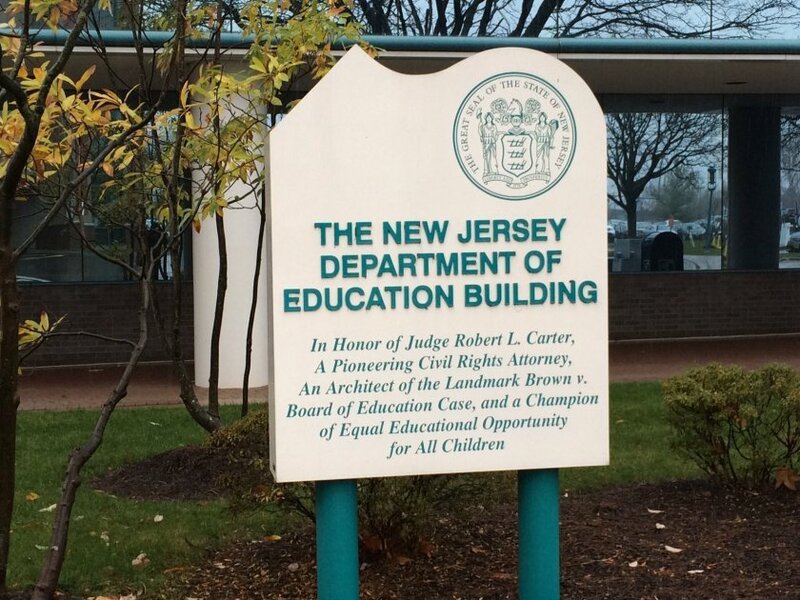 Yes, Murphy promised NJEA he’d “scrap PARCC day 1.” Yes, he’s in thrall to NJEA (which funds a third of Education Law Center’s budget). Yes, if the bill passes, he can veto it. But this strikes me as an odd stance for someone who presents himself as a progressive, as a friend of the downtrodden, as an equity advocate. Perhaps the Governor doesn’t understand that equity and accountability work hand in hand. While New Jersey can take pride in its great schools, accountability — enabled through standardized testing — explodes the charade that all schools are great. Our achievement gap — the difference between student proficiency among white and/or high income and minority and/or low-income students — is huge, the 22nd among 35 states for which data is available. The whole point of new tests aligned with course content standards is to call out these achievement gaps, not hide them by lowering standards. That’s hard, humbling work. But its end goal is equity: providing all students — not just those who go to wealthy suburban schools like SOS-NJ’s constituency — with what they need for upward social mobility. If Murphy and Repollet wanted to claim the label of “progressive,” they’d be insisting on accurate information in order to spotlight students historically overlooked. Instead, they appear to be doubling down on regressive strategies to hide those students’ needs and maintain the charade. I expect more from our leaders. I expect more from the Democratic Party. The Legislature should pass the bill. And, if the Governor wants to wear the label of “progressive,” he should sign it. If he doesn’t, if he allows NJEA and ELC’s agenda to erode his professed belief in equity because of some Faustian bargain, his label is downgraded to weakness, obsequiousness, and dishonor. 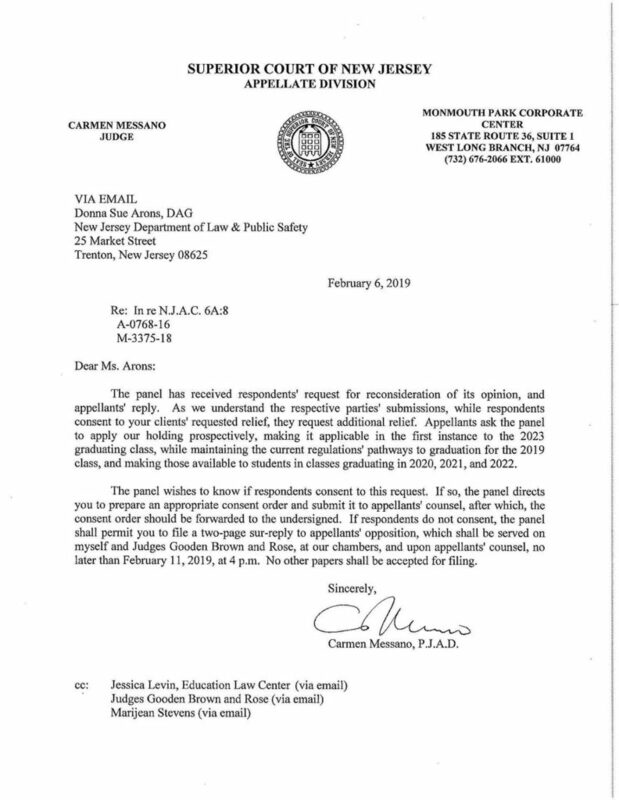 I write on behalf of We Raise New Jersey to urge that you seek immediately a legislative remedy to the December Appellate Court decision concerning New Jersey’s high school graduation requirement. It is our understanding that the remedy embodied in Senate bill 3381 and Assembly bill 4957, sponsored by Senator M. Teresa Ruiz and Assemblywoman Pamela R. Lampitt respectively, were the products of deliberations between the Murphy Administration and the sponsors, who are the chairwomen of their houses’ Education Committees. We believe that the legislation is the right response to the court decision and will avert the chaos that will result in the absence of legislative action. We commend you and the sponsors for devising this response swiftly. As Senator Ruiz correctly stated at the 28 January Senate Budget Committee meeting at which her bill was scheduled to be considered, the bill preserves and authorizes the regulations that were the product of the State Board of Education’s thoughtful deliberations. Furthermore, with the necessary legislative authorization, the regulations can be implemented without causing any disruption for students, families, and high schools. Consequently, we were perplexed and disappointed by the Murphy Administration’s decision to request a delay in Senate bill 3381’s consideration. Regardless of the action that the Appellate Court may take in response to the motion before it, legislation is needed. We do not understand, therefore, the rationale for requesting the delay. We are concerned too that the delay exposes the 2019 and 2020 graduating classes to unnecessary risks. We believe that the need for immediate legislative action is undeniable. Accordingly, we ask that the Murphy Administration seek the assistance of Senate President Sweeney and Assembly Speaker Coughlin to pass the Ruiz and Lampitt bills before the Legislature suspends its regular activities while hearings on the State Budget take place. Thank you for your consideration of our perspective. Member, New Jersey Senate Hon. Pamela R. Lampitt. Assembly Republican Leader Salma Chand, Esq. About Us: We Raise NJ is a diverse coalition of New Jersey organizations and associations that are united in our belief that New Jersey students need and deserve a world-class education to effectively compete and succeed in our rapidly changing world. Our coalition organizes the power of each member organization into a collective voice to advocate for high-quality academic standards and aligned assessments, and to ensure that every child is prepared for college, career, and active citizenship in our communities. Coalition members include the New Jersey PTA, JerseyCAN, the New Jersey Chamber of Commerce Foundation, the African American Chamber of Commerce of New Jersey, the New Jersey Business & Industry Association, the New Jersey Council of County Colleges, and the New Jersey Charter Schools Association. Learn more at http://weraisenj.org/ and see our principles regarding state tests. Next PostUpdate: Senate Committee Gives a Thumbs-Up to Equity!